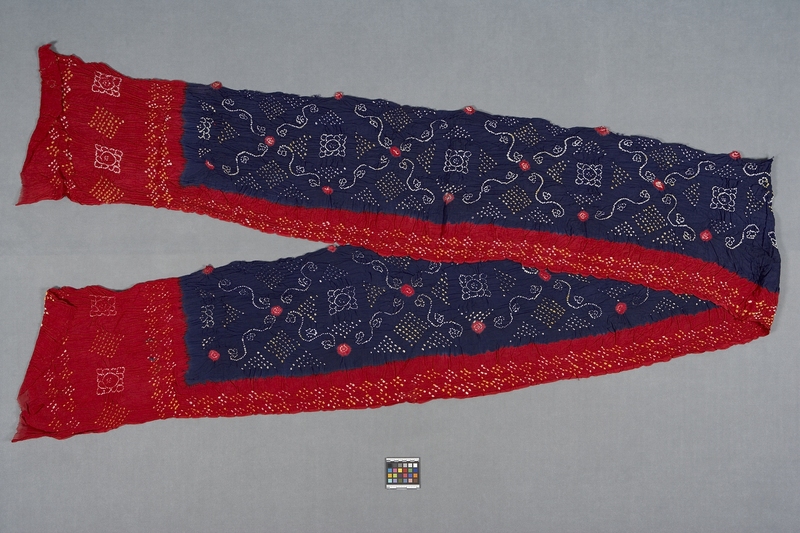 Item number 959/2 from the MOA: University of British Columbia. Large rectangular piece of thin, muslin-like, tie-dyed cotton. The outer border of the fabric has been dyed red, while the rectangular centre is a deep blue. Fabric has been folded in four and covered with elaborate geometric and scrolling patterns in white and yellow; patterns are comprised of small, yellow and white, square, outline-like shapes, with the centres showing the ground colour. Circular areas of red dye evenly spaced throughout the blue centre also feature designs with small white squares. Though the resist ties used to bind the fabric during dying to create the patterns have been largely pulled out, the material still has a strongly puckered appearance, obscuring the centres of the square shapes. Indian: Northern Indian ? or Indian: Central Indian ? North & Central India ?